As I predicted last month, the only consistently antiwar candidate on the Republican side of the aisle is breaking through  but in a spectacular manner that I certainly did not foresee. Suddenly, Paul is everywhere, from the Sunday morning talk shows to the length and breadth of the blogosphere. His amazing $4.2 million-in-one-day fundraising feat has entered the annals of presidential politics as the long-promised fulfillment of Internet-based political fundraising. And the myth that it’s all online and not translatable into real people is belied by his recent 5,000-strong Philadelphia rally and similar events in Iowa and elsewhere. Paul has become the equivalent of a rock star among the young, and his appeal goes way beyond the usual libertarian crowd: liberals and conservatives, all races and cultural types, from home-schooling Christians to San Francisco pagans and everything in between. On the Internet, and in the streets, the Ron Paul Revolution, as his followers have dubbed their movement, is taking off. The conventional wisdom, prior to this breakthrough, was that the Paul campaign was political vaporware, existing exclusively online and not in the material world. Yet that meme is quickly falling by the wayside as his polling numbers are rocketing upwards, from New Hampshire to Nevada. The money windfall  a result that the official campaign had nothing to do with, and which was generated entirely by Paul’s independent supporters acting entirely on their own initiative  has made an advertising blitz possible, with at least two television ads and several radio ads running in early primary states. All this buzz, however, has generated a counter-buzz, a sinister stream of smears and jeers coming from both Right and Left. What’s instructive is how similar these attacks are in their viciousness, and, in the case of the “serious” mainstream critics, their juvenility. Whether coming from the liberal and ostensibly antiwar Kevin Drum of the Washington Monthly and Matt Yglesias of The Atlantic, or from some neocon hack over at the Weekly Standard, the “Ron-is-crazy” meme is being furiously pushed upstream against the raging current of the Paul phenomenon  so far, to little avail. He’s a “fruitcake,” sniffs Drum, and the beat is taken up by Yglesias, who chimes in with charges of “extremism.” The Weekly Standard takes it a bit further, and, with its characteristic snark, dubs Ron the “don’t tase me, bro!” candidate, complete with an illustration of Paul being hustled off the stage by uniformed thugs  which is what they’d like to do to all of their political opponents. David Weigel was absolutely right when he predicted it months ago, although the trepidation in his tone was, I think, unwarranted. Yes, the smears are getting really ugly, but precisely because of that the Smear Bund is generating a pro-Paul backlash, particularly among those who consider themselves liberals of the old school. Glenn Greenwald, whose popular “Unclaimed Territory” blog was claimed by Salon a while back, has risen as Ron’s champion on the Left: Paul’s is “a campaign that defies and despises conventional and deeply entrenched Beltway assumptions about our political discourse and about what kind of country this is supposed to be,” he writes. Greenwald “gets it,” in a way that shows his own awareness of the change liberalism is undergoing, as it faces the all-out assault of the neocons and the War Party on every front. A tireless critic of the surveillance state and an informed, fierce opponent of the neoconservatives in the foreign policy realm, Greenwald has watched the rise of Ron Paul in the context of Hillary‘s apparent inevitability. Indeed, his spirited defense of Paul is rooted in his contempt for the pro-war and distinctly neoconservative foreign policy stance at the core of her oily evasions. The contrast with Paul’s forthright and principled opposition not only to the Iraq war, but also to the underlying premise and assumptions that govern our foreign policy of global interventionism, can’t be evaded by intelligent liberals, of which Greenwald is one. This is also what seems to be generating Andrew Sullivan’s enthusiasm, among the more intelligent (albeit flighty) of the conservative intellectuals who write about public policy on the Internet. Coming from different directions, and moving toward libertarianism, Sullivan and Greenwald are representative of the many thousands of thoughtful and politically active Americans, on both the Right and the Left, who, brought together under a single antiwar, pro-civil liberties banner, see Ron Paul as a kind of symbol  a hope that real change is possible. Faced with a “choice” between liberal hawks and outright neocons, the anti-interventionist Greenwald has nowhere to turn. Confronted with a Clinton restoration armed with the PATRIOT Act, the Military Commissions Act, and a well-earned reputation for vindictiveness, it’s no wonder the civil libertarian Greenwald is hardly jumping for joy. Two generations of liberals have come to the freedom movement on account of the war issue. Check out my little essay on John T. Flynn, whose critique of U.S. foreign policy in the run-up to World War II and the wholesale violation of civil liberties by FDR’s wartime administration got him kicked out as a columnist for The New Republic and given a place of honor at the Chicago Tribune, the Midwestern redoubt of “isolationist” (i.e., antiwar) sentiment. Flynn, a leader of the antiwar America First Committee, became a leading figure in the postwar conservative-libertarian movement. The second generation of liberals-come-to-libertarianism came in during the Vietnam War era: it was opposition to that war, and to what seemed to be an emerging police state, that birthed the infant libertarian movement. Recruiting, in turn, from Left and Right was a self-conscious strategy that the movement’s intellectual leader at the time, Murray N. Rothbard, pursued in hopes of building an independent third force that was neither “Right” nor “Left,” but solidly pro-liberty. This effort was embodied in the journal Left & Right, which was devoted to introducing such Old Right anti-interventionists and anti-statists as Garet Garrett to the antiwar New Leftists in search of a comprehensive, coherent analysis of the tumult around them. These second-generation cadre formed the Libertarian Party and, more importantly, made possible the growth of libertarianism as an intellectual movement, culminating in the boom of the mid-Seventies to mid-Eighties. Paul ran as the party’s candidate in 1988, but by then the LP’s political momentum had peaked prematurely, on account of a debilitating split at the party’s 1983 national convention, when half the activists walked out. The challenges of the Bush era, when not only our foreign policy of perpetual war but also what Lew Rockwell calls “red-state fascism” is rearing its increasingly ugly head, is inspiring a third generation of liberals to make the transition to a recognizably libertarian stance. On the Right, a similar reaction to Bushism is causing a growing number of conservatives, such as Bob Barr, to join the libertarian ranks, while many others, such as Tucker Carlson, are clearly sympathetic. The wave of support and publicity for Paul has the neocons enraged, and they are busy trying to discredit him with a campaign of unsurpassed villainy. What they have done is actually kind of funny, if you take your humor black: they’ve simply transferred their usual blather on the foreign policy front to the domestic battlefield. Instead of claiming that Saddam Hussein or Mahmoud Ahmadinejad is Hitler and we’re facing another Munich, they’re saying Ron Paul is Hitler and we’re facing another Kristallnacht. The Hot Air “scoop” was that some obscure racist who hardly anyone has heard of gave $500 to the Paul campaign. And that is it. That is Paul’s great “sin.” Hillary Clinton is getting millions from the military-industrial-imperial complex; the foreign lobbyists and the special interests buy and sell our leaders like cattle at a county fair  but what really matters is that Ron Paul received a contribution from someone whose opinions the candidate doesn’t endorse and cannot be responsible for. Of course, anyone could be motivated  or persuaded  to contribute to a political campaign for all kinds of reasons. Who’s to say who did the persuading, or actually put up the money? “Dirty tricks” and politics are practically synonymous. However, even taking the source of the contribution at face value, going after Paul over $500 from some unknown wacko with dubious motives is really a stretch. It is, I think, very off-putting to liberals of Greenwald’s sort, who are beginning to understand why this strained yet energetic effort is being made to discredit an honest, principled, and decent man. To stanch the incipient pro-Paul rebellions at both ends of the political spectrum, the anti-Paul brigades have called out two disparate, albeit strangely congruent, figures to start slinging some real dirt in Paul’s direction. Despite the ideological divide that separates Glenn Beck, who recently did a segment on his show accusing Paul of being a “terrorist” along the lines of Timothy McVeigh, and David Neiwert, a self-proclaimed “professional journalist” and resident left-blogosphere “expert” in right-wingology, both have come out with very similar assaults on the Paul campaign. Neiwert, whose recent series of blog posts attacking Ron Paul takes the same line as Paul’s neoconservative critics, gives the Paul-is-Hitler meme a “leftist” patina. Both explicitly invoke the name of McVeigh, a violent and dangerous extremist, as emblematic of the Paul campaign. That Beck hauled out the ineffably repulsive David Horowitz to pull off his drive-by smearing indicates just how broad this anti-Paul “popular front” is, stretching all the way from the ex-communists of the 1960s turned warmongering neoconservatives to the present-day lefties of Neiwert’s ilk. The Right and Left faces of the Smear Bunds are singing slightly different tunes, but in unison. To Beck, who never mentions that the Paul fundraiser he rails about was based on a movie, and not Guy Fawkes the historical personage, Paul is a supporter of terrorism. To Neiwert, on the other hand, who has run a long list of legislation introduced by Paul that  gasp! Horror of horrors!  demonstrates beyond the shadow of a doubt that Paul opposes a lot of federal programs and doesn’t believe government is the be-all and end-all solution to our problems, he’s worse than a mere terrorist: he’s an authentic conservative! The Republican Establishment must be thrilled. 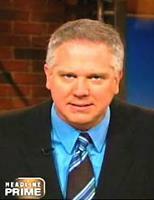 Neocon Glenn Beck and leftist smear artist David Neiwert: together at last! Neiwert is right: this isn’t guilt-by-association, it’s worse. It’s mass smearing on a scale never before attempted. Neiwert presumes to act as a gatekeeper to authoritatively delegitimize any and all ideas held to be “extremist” or “radical Rightist.” If you question the value of public education, you’re an “extremist.” Hate the IRS? Watch out, or you’ll fall prey to “radical Rightists.” He writes his books, articles, and blogposts  and bases his entire literary reputation  on the supposed existence of a radical Right threat, which he and his fellow “experts” have “studied,” albeit with none of the cold-eyed objectivity of the scientist but rather with a clear agenda in mind: extreme political correctness of the leftist variety. Neiwert’s is a literary tradition that stretches back to the sociological gobbledygook churned out by Theodore Adorno and his followers, who “diagnosed” all opposition to the policies of Franklin Delano Roosevelt as clear evidence of an “authoritarian personality”: if you opposed the New Deal (and the war) this was evidence, in Adorno’s view, of incipient “fascist” tendencies. John Roy Carlson, Harry Overstreet, the tag team of Arnold Foster and Benjamin Epstein, and a bibliography a mile long are testaments to the growth of this mini-industry, which has existed in this country since the 1930s and experienced an upsurge in the postwar period. The neocons brought out their own rather over-intellectualized version of this smear literature in the early 1960s, in response to the rising Goldwater phenomenon: The Radical Right, edited by Daniel Bell and Seymour Martin Lipset. Their argument was this: anyone who opposed the postwar liberal welfare state was not only a dangerous extremist, but also no doubt suffered from “status anxiety,” i.e., they were crazy. This same Smear Bund brought out a “psychological analysis” by a group of psychiatrists that diagnosed Barry Goldwater as being mentally unstable as well as an “extremist.” A more spurious and disgusting libel was never invented  at least, not until the Smear Bund put Paul in their sights. Neiwert is a fool who once attacked both Lew Rockwell and myself for not having the “correct” interpretation of what fascism is and how it develops. According to him, my own interpretation of what American fascism might come to look like shows “no understanding” of the reality, which resembles, in his mind, the “patriot” militia groups that burgeoned during the Clinton years. That many of these same people support Paul’s opposition to the IRS and inveigh against the “New World Order” (i.e., American imperialism) is, for Neiwert, proof positive that it isn’t the Bush administration’s militarism and authoritarianism that poses a fascist danger  oh, no, certainly not! In his book, it’s Ron Paul who heralds the rise of fascism. Yet they are making it up, and they will continue to make it up: anything to divert attention away from the vital issues of war and peace, over which a world  and a way of life  hangs in the balance. The appearance of an antiwar candidate in the Republican primary, one who is furthermore making substantial gains and a fair amount of noise, stands as a testament to the failure of any of the Democrats to take advantage of what is, after all, the antiwar majority in this country. Even as our soldiers are fighting and dying in Iraq, and the administration paves the way  with Hillary Clinton’s help  for a war with Iran, the American people overwhelmingly reject our foreign policy of relentless aggression and serial “regime change.” The majority is effectively disenfranchised. That’s why the Paul campaign has captured the imagination of young people and all those looking for an alternative to the increasingly intolerable status quo. The neocons and the Neiwerts, separately or together, can’t do much about it, as they’ll soon learn to their sorrow: their obviously dishonest and ill-motivated attacks will drive honest liberals and conservatives into Paul’s camp, not away from it. Why are they so afraid of Ron Paul? In the face of both Fox News and the hard Left hurling anathemas at him, that’s what honest liberals and conservatives are beginning to ask  and I don’t think the Smear Bund is going to like their answer. So, should Ron Paul return the $500 contribution? My answer here, and here. I’m working on a tight deadline, and I don’t have time to go into a long spiel about how important our fundraising drive is, and why a world without Antiwar.com won’t be a better world. I just want to say that this particular column is yet more proof that we are in the front lines of the fight for peace and liberty, and our audience  some 100,000 daily, on weekdays, and almost as much on weekends  is worth reaching with this message. So why don’t you take the time to contribute online right now  now that you realize how important it is.